William Massa is a name known to many Horror Novel Reviews readers. Massa reviews the works of others frequently and often speaks his mind on the comment boards. However, what might be less known to the reader is that Massa is also an accomplished speculative fiction author. He has written several horror novels, including: Gargoyle Knight and Silicon Man. 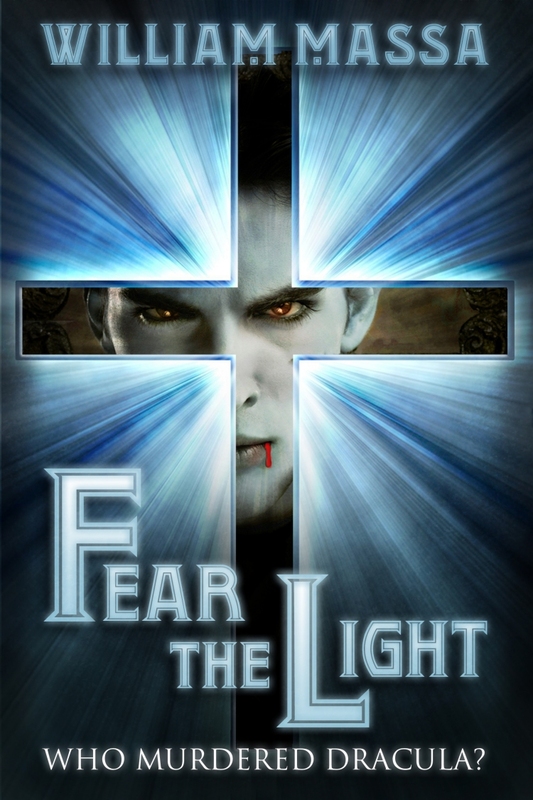 Fear the Light is a horror/mystery novel self-published by William Massa. The book begins with the death of an icon. Count Dracula has been killed by an unknown assailant. His children are summoned to a chateau in France to grieve their master’s death. However, as the morning sun rises, another death occurs. It appears the murderer may walk among them. There is no escape while the sun still shines and it appears that the culprit is far from finished. What follows is a traditional “who-done-it” mystery with very untraditional characters. Villain is victim. Predator is prey. Eight vampires quickly become seven and then six as the killer continues their work. Former Texas Ranger, and current vampire, Vincent was a lawman and is perhaps best suited for solving the crime, but it will not be easy. All of his suspects are by their very nature malevolent beings with hearts as black as night. Could it be Faust – the former Nazi? Zane – the 1970s drug dealer and biker? Sebastian – the perpetual teenage street urchin of Victorian England? Fear the Light is exactly what self-publishing is supposed to be about. Self-publishing is an outlet to get unconventional stories, often overlooked by mainstream media, to the public. William Massa accomplishes this while avoiding many of its pitfalls, i.e. poor editing and absence of a cohesive plot. The narrative of Fear the Light is incredibly stream-lined. Yet characters and locations are fully developed. Vincent, our protagonist, is your quintessential reluctant vampire. He doesn’t prey on humans anymore, preferring to drain animals. He is part Christian, the bar-tending vampire in Lost Souls, and part Angel of Buffy the Vampire Slayer fame. He is instantly likeable and accessible. Vincent gives you someone to root for even in a book populated with monsters. This said, Fear the Light is not for everyone. It is more mystery than horror. Moreover, while the concept is original, the delivery is very formulaic as a “who-done-it” novel. Expect the vampires to drop dead one by one, as Vincent struggles to put the pieces together in time. If you enjoy that sort of story, you will love Fear the Light. However, don’t expect a reinvention of the wheel. It delivers the twists and turns you expect. Pick it up now and enjoy the ride.